CIA Is Quietly Ramping Up Aid To Syrian Rebels, Sources Say : Parallels The White House has decided to provide more covert training and weapons, including anti-tank missiles, in a bid to counter President Bashar Assad's growing strength in the civil war. 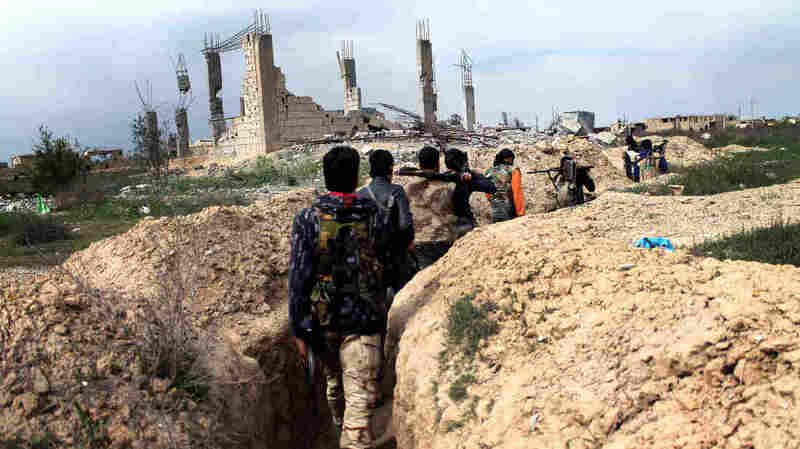 Rebel fighters carry their weapons along a trench in the northeastern city of Deir Ezzor on March 24. The CIA is stepping up training and military assistance to moderate rebels, according to U.S. sources. The U.S. is providing more arms and training to the moderate rebels in Syria, under a growing secret program run by the CIA in Jordan. Sources tell NPR that secret program could be supplemented by a more public effort in the coming months involving American military trainers. The change in strategy comes as the White House sees Syrian leader Bashar Assad growing in strength, and continuing to strike rebel strongholds. Another factor: Russian leaders appear unwilling to help end the three-year-old civil war and are continuing to provide weapons to Assad. Finally, al-Qaida fighters and their allies are expanding in Syria, a development that some believe could threaten the U.S. homeland. The ramped-up covert program is an attempt to further pressure the Assad regime and its allies to reach a political settlement, not necessarily to achieve a military victory by rebel forces. Skeptics doubt the U.S. effort will help much, given the weakened state of the opposition and the inroads made by al-Qaida fighters. The moderate fighters being supported currently have relatively little influence on the ground. Still, the U.S. plan calls for both small arms and more powerful weapons such as TOW missiles, which can penetrate tanks and other armored vehicles. Rebel forces were pictured last week with some of the first TOW missiles, and sources say that the effort will expand throughout the next year. It's uncertain if the U.S. is sending the TOW missiles through Saudi Arabia, which is also supporting the rebels. There is a debate within the White House whether to supply rebels with shoulder-fired missiles, which could target Syrian helicopters. There are fears those missiles could fall into the hands of al-Qaida, and produce a threat to commercial aircraft and allied warplanes in the region. The White House has said little publicly about the new, expansive effort to help the moderate rebels. "The United States is committed to building the capacity of the moderate opposition, including through the provision of assistance to vetted members of the moderate armed opposition," said National Security Council spokeswoman Bernadette Meehan, when asked recently about the TOW missiles. "As we have consistently said, we are not going to detail every single type of our assistance." 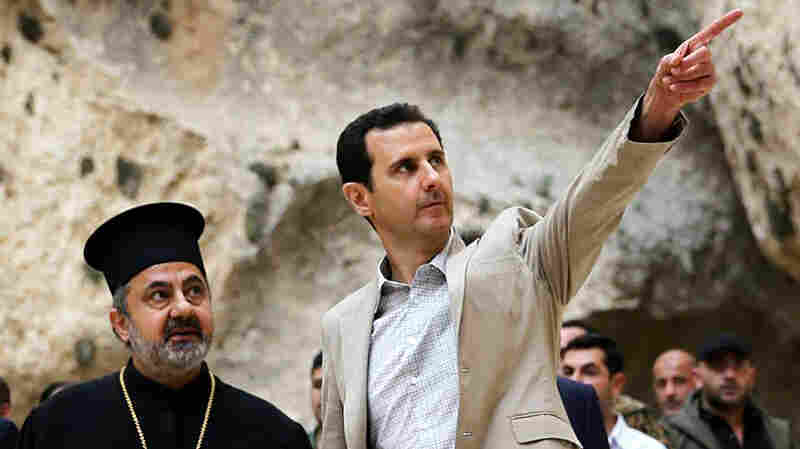 Syrian President Bashar Assad (right) visits the Christian village of Maaloula, near Damascus on Sunday. Assad's forces have been gaining the upper hand in the fighting, and the CIA is now increasing training and aid to Syrian rebels. In addition to the arms transfers, a training program already in place in Jordan and run by the CIA will grow in the coming months. And that program, though still secret, could include the Pentagon's special operations forces and contractors to train more rebels in combat skills. Meanwhile, the Pentagon is drawing up training plans of its own for White House consideration, and such an effort would lend a more direct and public American role in the Syrian civil war. The Defense Department planning is twofold. One option calls for U.S. military trainers to take part in the training underway in Jordan. Another calls for the U.S. military to train the Jordanian military, who would in turn train the Syrian rebels. This is what the military calls the "train the trainers" model. Also on the table are possible U.S. airstrikes against select military targets in Syria, a move favored by some high-level officials. The chairman of the Joint Chiefs, Gen. Martin Dempsey, already has told Congress that limited airstrikes might not achieve the desired result and could lead to civilian casualties. He has said the best approach for the U.S. would be to train Syrian rebels in Jordan. "I think [training is] the most effective," Dempsey told NPR earlier this year. "The one that would produce an outcome that would be sustainable over time would be one where we empower ... that moderate group — assuming we can still find them in that mixture — to assist them in establishing security, overcoming the challenges they face." Sources briefed on the covert effort say that the intelligence community will continue to lead this "robust" program of increased arms and training. The White House will see how this effort develops before deciding on whether the Pentagon would play a more public role. This first covert shipment of TOW missiles is a test, said a member of the Syrian opposition briefed on the negotiations. The Harakat Hazm rebels, considered a moderate group, say they have received 50. A shipment of Croatian weapons sent to moderate fighters, with U.S. knowledge, a year ago, ended up in the hands of al-Qaida-linked groups. This time, fighters are encouraged to post videos on YouTube to prove they are using the missiles for the intended purpose. One fighter reached via Skype said that they were required to return the casings of the missiles to "a foreign intelligence agency" to prove they had used them. The next step will come when Ahmad Jarba, leader of the Syrian political opposition in exile, visits the White House early next month. He is expected to request additional TOW missiles. And while the debate continues at the White House over shoulder-fired missiles, Jarba is expected to request anti-aircraft guns in the hopes of rebels being able to bring down Syrian government helicopters. The guns are less portable, since they must be towed by a vehicle. But they're more politically palatable than shoulder-fired missiles. One source tells NPR that some shoulder-fired missiles, the Russian-made SA-7, already are making their way to the Syrian battlefield from Libya. Advocates of the enhanced American program say they hope to change the momentum on the ground, given that Syrian leader Assad has been pounding rebel enclaves, at times with "barrel bombs" dropped by helicopters. Skeptics of the U.S. plan say the enhanced arming and training effort would have made a bigger impact two years ago, when the entire national security establishment — from Defense Secretary Leon Panetta and Gen. Dempsey to Secretary of State Hillary Clinton and CIA Director David Petraeus — pressed the White House on such a plan. The White House rejected it. Some analysts also see the effort as an attempt to repair bruised U.S.-Saudi relations. Obama recently visited Saudi Arabia's King Abdullah, who has long pushed for greater support for Syrian rebels. "Today, Assad is winning the war in Syria quite handily, and I think most Western powers have completely written off the rebels," says Joshua Landis, of the University of Oklahoma. A Syrian youth walks near a vehicle in flames following an airstrike, allegedly by government forces, on April 4 in the northern Syrian city of Aleppo. But after the U.S. backed off planned airstrikes last fall, a furious Saudi Arabia vowed to go it alone in Syria. Landis says that would be a red line for the U.S., which fears that sophisticated weapons would be given to extremists. Working together to send TOW missiles, he thinks, allows the U.S. to keep "monitoring the Saudis, and keeping them from trying to give too many sophisticated weapons to crazy people in Syria." But Secretary of State John Kerry is said to be supportive of the new, more robust American assistance plan, with sources saying he's been frustrated that talks in Geneva to end the civil war fell apart in February. "It's very clear that Bashar Assad is trying to win this one on the battlefield instead of coming to the negotiating table in good faith," Kerry told reporters soon after leaving Geneva in February. And Kerry has been particularly angry that Russia has not been helpful in bringing the war to an end, but instead is providing Assad with weapons. "Russia needs to be a part of the solution and not be contributing so many more weapons and so much more aid that they are in fact enabling Assad to double down," he said after the Geneva talks. 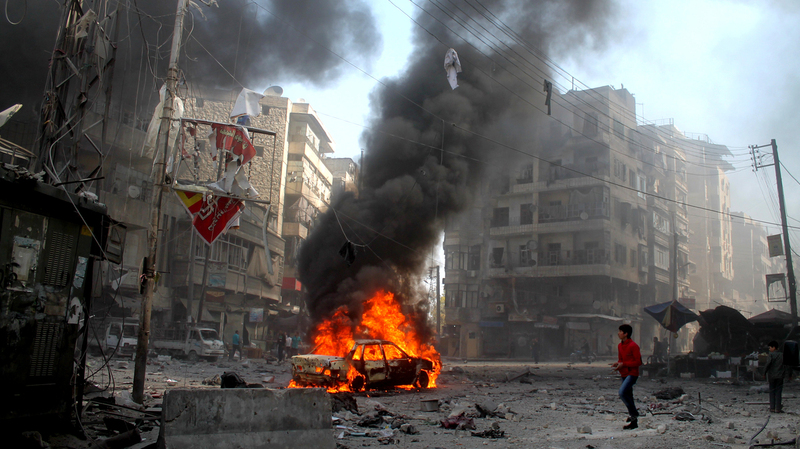 Another factor in the U.S. thinking is the growth of extremist groups in Syria. The intelligence community estimates there are as many as 26,000 extremists — some linked to al-Qaida and some so extreme even al-Qaida has disowned them. James Clapper, the director of national intelligence, has told Congress that a faction linked to al-Qaida in Syria, the Nusra Front, "does have aspirations for attacks on the homeland." Advocates of the new American program hope that training the moderates will serve as a counterweight to al-Qaida and could peel away some of those fighters with the promise of more support. The U.S. threatened airstrikes against Syria last fall following tough talk by both President Obama and Kerry about Syria's alleged use of chemical weapons against its own people. But the administration opted not to strike after assurances from both Assad and Russia that the chemical weapons stockpile would be destroyed. That effort is continuing. Now most of Syria's declared chemical weapons have been shipped to a Syrian port and readied for destruction. But sources say Kerry is convinced that Assad still is holding on to some of those lethal chemical weapons. And the U.S. is now investigating new allegations that Assad's forces have attacked rebels with chemical weapons. "We have indications of the use of a toxic industrial chemical, probably chlorine, in Syria this month," State Department spokeswoman Jen Psaki said. She added that the chemical was believed to be used against a rebel-held village north of Damascus.